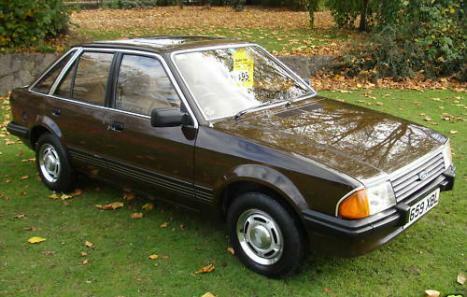 5 Doors, Manual, Hatchback, Petrol, 50,000 miles, Brown, MOT-10-2010, 1 Owner. Drives very well, folder full of paper work, Wood/wood effect trim, Adjustable seats, Chrome wheels, Full History, Sunroof. The car was sold in 1983 by the local Ford dealer to an elderly gentleman called Percy who kept it from new until his death in 2009. This car was clearly loved and adored, as the history identifies. This car is not rotten its solid, orginal paint work from new, velour upholstry in excellent condtion, all electrics work well. The only minus point is that there are a few marks on the car, on the rear of the o/s quarter panel, o/f panel and front valence. The old chap caught the car on the corner of his garage a few years ago and made the marks, but that's not too bad for a 27 odd year old car and can be easily sorted unlike the dreaded rot that these cars normally suffer badly from it has a new battery and dizzy cap arm and spark plugs also. In summary, the car has been well maintained, is a true classic, has to be seen to be apreciated. It's not a new car though - please don't turn up thinking it is a car that is only three years old!! This is a good classic car, and a good example of a Ford in its heyday. if you are looking for a nice classic car at sensible money which will continue to increase in value then please come and view.